When the magnum opus of wearable tech comes along, you just know. 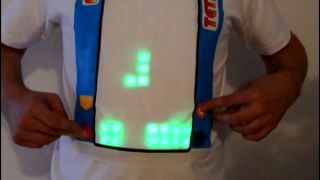 To celebrate Tetris's 30th birthday, gaming fan Marc Kerger created a t-shirt on which you can actually play the game. Sure, it's not the most ideal of angles to play from (and you can't actually buy one yet), but at least this is a wearable we'd actually use. Doesn't look like Kerger will be knocking Steve Wozniak off the score tables any time soon, but he's still playing a better game of Tetris than these people. Jeez. Other than Virtual Boy flashbacks, what did Miyamoto see in the Oculus Rift?